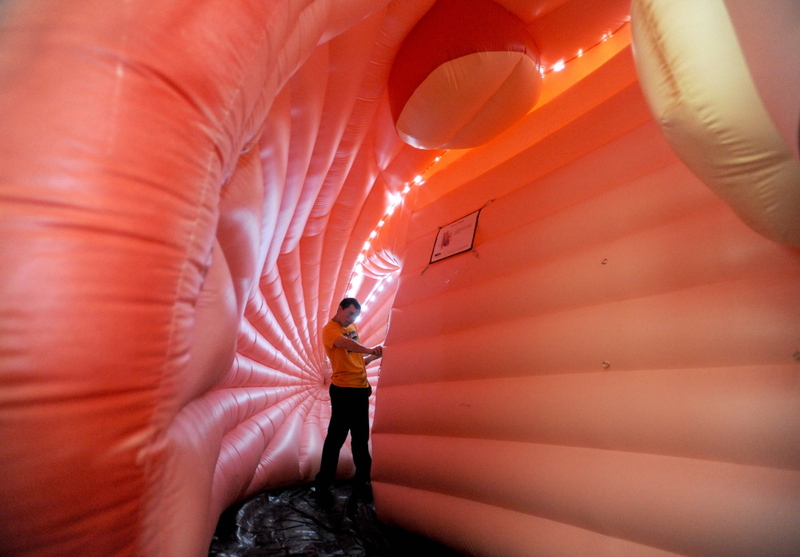 The 32nd annual event was highlighted by an exhibit of large inflatable body parts attendees could walk through. 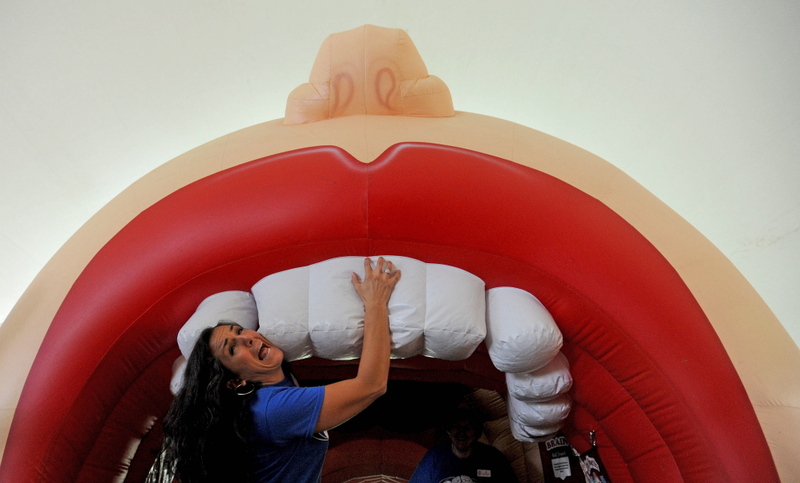 At the mouth of a 50-foot inflatable body, 3-year-old Isaac giggled while his mother, Sarah Reynolds, hoisted him up to pretend to brush the inflatable’s oversized teeth. 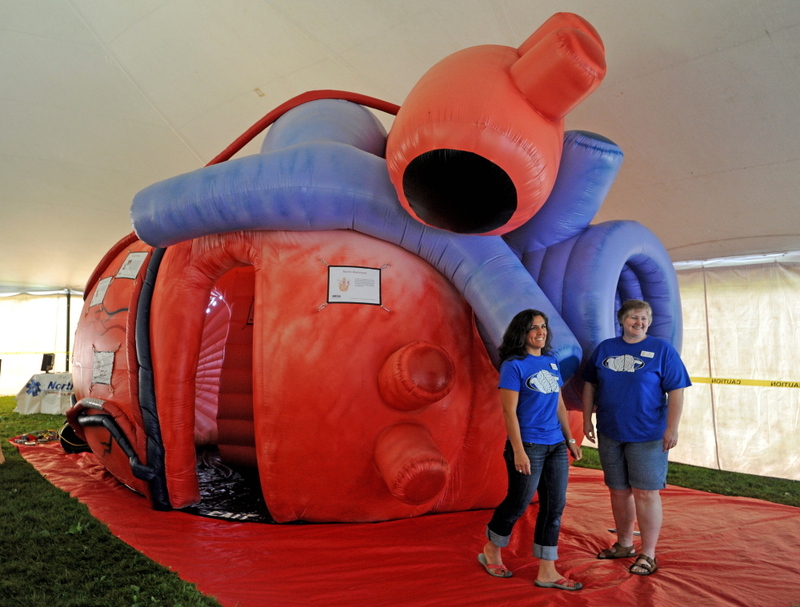 The inflatable body, along with giant inflatable heart, lungs and brain were part of the 32nd annual Wilton Blueberry Festival that each year draws 4,000 to 5,000 attendees. The two-day festival continues Saturday with a 9 a.m. parade, activities all day and fireworks at the boat launch at dusk. 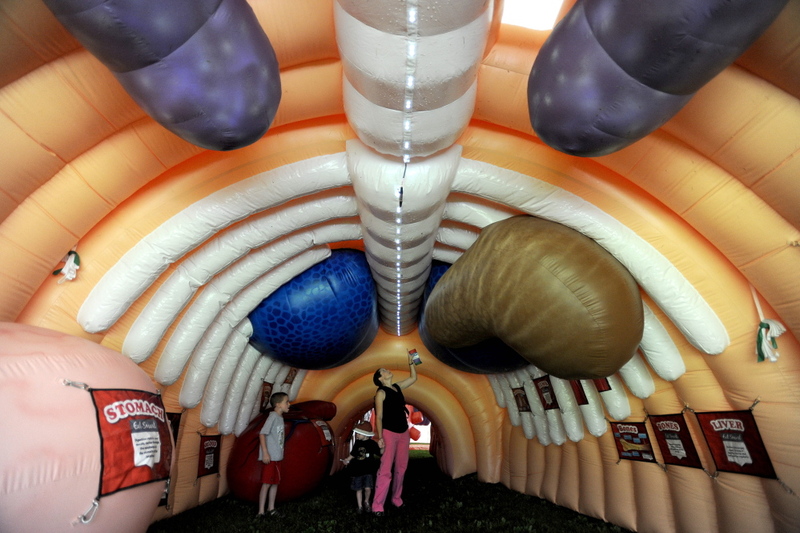 The Mega Body exhibit, brought from Texas, was a new feature for attendees to enjoy, along with the traditional highlights of a parade, food, children’s activities and fireworks. Reynolds, a teacher at Cascade Brook School, said she had previously taught about the human body and thought the exhibit was a way for her kids to have fun and learn about health and the body. “I wanted them to have that experience,” she said. The president and CEO of the company that owns the Mega Body exhibits said she does not normally travel with the exhibits, but was on site Friday for the Wilton festival. “I don’t normally come with the exhibit but it’s just such a cool festival,” said Lauren Hill. Hill said she started the exhibit to because she had a background in health care marketing and thought there would be an interest in a hands on way to learn about the body. She encountered a large heart that was on permanent display in Pennsylvania and decided to make a mobile version of the walk-through exhibit. 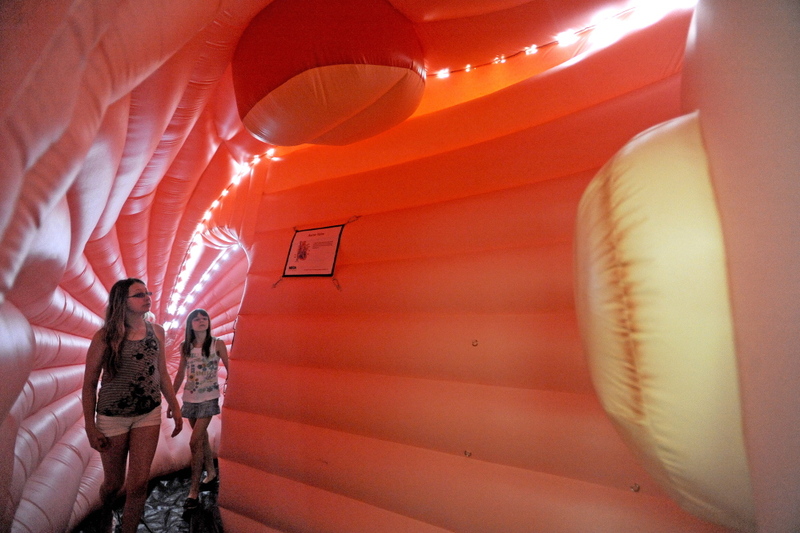 “It all started with the heart,” she said, gesturing toward the large inflatable. The heart was built so people could walk through it and see what certain defects look like, as well as valves, arteries and the structure. “You can read a brochure all day, but I’m a very visual learner and this is a way to visually learn,” she said. Across the park from the inflatables, Wilton resident Chelsea Cloutier stood with her children at the face painting tent. She said she and her three children had just arrived at the festival, and the girls were eager to get started. “They’ve been waiting all day,” she said. Cloutier said she grew up in the Wilton area and now lives near Kineowatha Park, so attending the festival has long been a tradition for her. She said her girls, Madison, 6, Tessa, 3, and Arabella, 1, already look forward to the kids activities each year. “They love the parade and the candy is a big hit,” she said. Nearby festival attendee Ami-Lyn Robinson was pulled by her two children Patrick, 7, and Isabel-Lyn, 5, from the face-painting area to a fishing game. 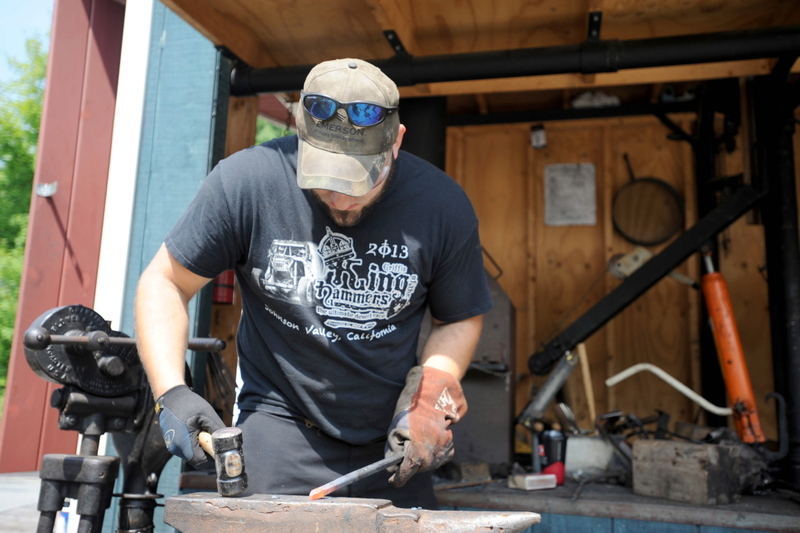 Robinson said she has attended the festival for her whole life and now that she moved from the Wilton area to Waterville, the annual event is a good way to meet back up with relatives. “Every year we meet up with my aunt,” she said. She said Patrick and Isabel-Lyn were enjoying all the games, especially the dunk tank and the new Mega Body exhibit. “They were fascinated by it,” she said.